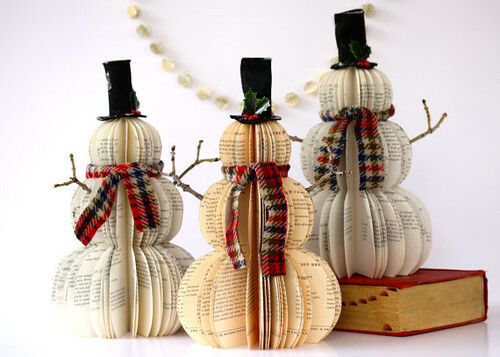 These nattily dressed snowmen, as seen in Hanna Gritton's Colorado Etsy shop Hi Butterfly have me humming White Christmas. Hanna has a knack for transforming vintage books - in this case, cookbooks - into clever home decor. She also uses books to make Christmas trees and ornaments, as well as seasonal apples, pumpkins, and turkeys... the list lengthens as she comes across items that spark her imagination. Ever since childhood Hanna has been enamored with the idea of turning something old and plain into something new and beautiful. The glitter dusted snowmen will be making an appearance in the 2013 Better Homes and Gardens holiday issue. Remember Melissa Kojima, the Artist at LA LA Land, who makes unique vintage-style paper puppets, cards, and decorations? 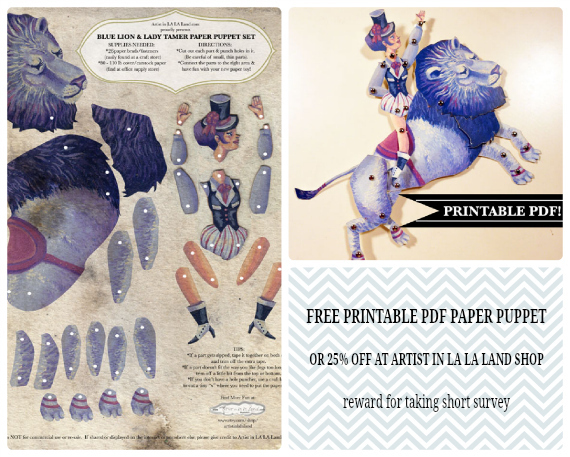 She wrote to say that responders to a short survey that will help her build her business will be able to pick a free printable PDF paper puppet (see selection here) or receive a coupon for 25% off at her Artist in LA LA Land paper play shop which includes pop up cards and paper mache Christmas ornaments. Here is the link to the survey [edit: no longer available]. Have a great weekend and make merry! I'm in love with those snowmen. They remind me of the birdhouses we used to make when I was a kid. Ours were made out of readers digest magazines. Superb Ann nicely snowmen I love your work!